Hammers Interskol, according to statistics, are reliable tools. Refusals recorded much less frequently, than in the more popular models Makita, Bosch, Hitachi. The main rule: Choose a model, which is designed for a load and is designed to perform the planned works. Using hammers as intended in accordance with the operating requirements of the punches can work for a long time Interskol. But, like any tool, in rotary hammers there are various faults that require repair punch yourself, especially if he is no longer a guarantee. 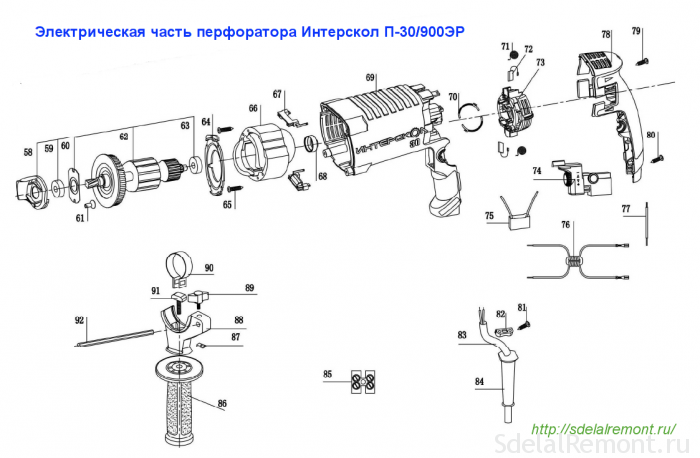 To perform the repair hammers Interskol, troubleshoot, it is necessary to carefully examine the instrument device, his circuit, lubrication chart. Any repairs perforator Interskol begins with his disassembling this in more detail. Hammers Interskol have high maintainability, simplicity and reliability. Repair hammers Interskol own hands able to perform any user, who knows how to keep the screwdriver, hammer and versed in electrical engineering at the high school level. Consider for example all the faults Interskol perforator P-26 / 800ER. The first group consists of fault breakage, associated with the failure of the impact mechanism parts. This fault is shown in the group, that when the hammer drill, and the batter can not. The weakening of the force of the impact is gradual. As the wear of the rubber rings occurs air leakage in the pneumatic system, the creation of strike. Shot Power weakens, blow gets tough. In addition to loss of properties is the destruction pneumatic impactors, Boykov, pressmass. Repair Interskol punch when worn sealing rings is to replace them with new ones. Installing new rubber rings made for any disassembly punch with the mandatory application of grease O-rings and lubricants, inert to rubber products. These lubricants belongs domestic type lubricant Ciatim-224, proizvodimaya GOST 9433-80. A rubber O-ring is lubricated with a thin layer of lubricant Ciatim-224 and fits over the desired item, pre-washed by the old grease in a solution of a mixture of kerosene and gasoline. At the big deterioration of the rubber O-rings and delayed their replacement is destroyed pressmassy pos.16, trunk poz.36, body catcher poz.40, striker poz.45. From the impact on the details appears peening, cracks, curvatures, jamming. 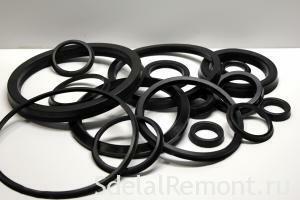 Problems can be solved by replacing components with new mandatory change of seals. Break off the ears of the installation poz.48 finger. Repair punch Interskol P-26 / 800ER and its destruction of the piston is performed by replacing the piston on the new. By purchasing the piston, carefully check the roughness of the inner surface of the piston. It should be brought to a mirror finish. Failure of the key barrel. 36 not often seen. main reason, scratches on the inner surface at failure of strikers, Boykov, prommassy. If the scratch depth is not great, the scratches can lead laps. At great depths of scratches ensure tightness impossible, and this affects the work of the punch in "Blow" mode. Shock pulse is created not only the striking mechanism of the pneumatic system, but also the transformation of rotational motion into reciprocating through the work of the rolling bearing poz.60. There are cases of destruction of the bearing cage. With the destruction of anti-friction bearing punch repair Interskol P-26 / 800ER is the complete parts replacement. Report transmission torque in reciprocation may be interrupted due to the toothed wheel slippage splines in splined poz.62 combined rolling bearing poz.60. The fault is eliminated correcting tooth profile using a round needle file. Dropouts mode pin is shown at improper operation mode switch. Translation handles the mode dial does not move the leash poz.55 switch. Breakage eliminated correcting assembly intermediate shaft pinion poz.58. troubleshooting Group, in which hammer hammer, but do not drill. Loss of drilling at the working stroke is manifested when turning on the shaft barrel gear poz.36 poz.35. Gear fixed to the trunk of three rollers poz.37. And in order to securely hold, pinion presses spring poz.33, seating washer through poz.32 circlip poz.31. 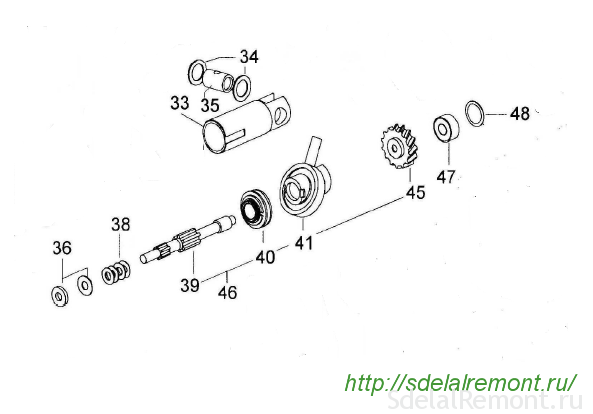 Error occurs due to deterioration of strength of the pressure spring, loss rollers, the destruction of the sleeve cam poz.38. Repair punch Interskol P-26 / 800ER their own hands is to restore all items in the desired position, or replacement of defective. Intermediate shaft punch serves to transmit rotational and reciprocating impulse. If any part, installed on the intermediate shaft, because of the damage can be turned, hammer drill stops. Consider the principle of operation of the intermediate shaft Interskol perforator P-18 / 450ER. Rotation of the shaft is transmitted by the gear poz.46, cranked rotor punch. Gear fitted on the shaft poz.43, which are mounted half-coupling cam and roller bearing poz.44 poz.45. Enabling pin mode occurs due to movement of the switch strips poz.55, that outputs of the roller bearing engagement of the coupling halves cam poz.44. At intermediate shaft Interskol perforator P-26 / 800ER toothed wheel can be rotated combined poz.62. The fact, The wheel is rotated by the engagement of the tooth in the socket bearing drunk. Cranking may occur due to attenuation of the spring poz.63 and wear tooth profile, both gears, and the clutch. The fault is eliminated by reduction of tooth profile in combination gear, drunk bearing. 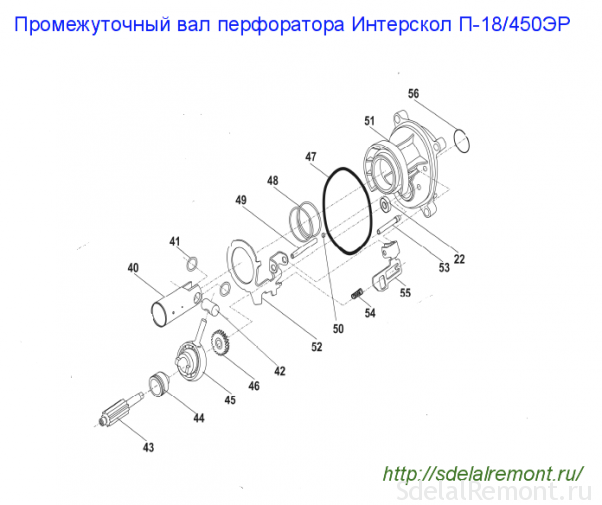 The design of the intermediate shaft perforator Interskol P600ER characterized by a common shaft poz.39. 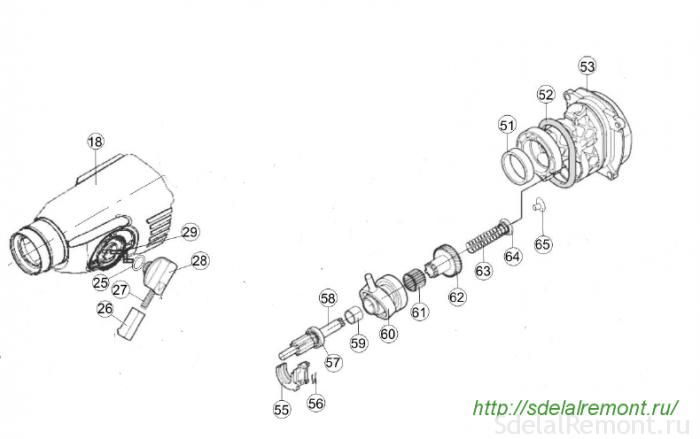 Slippage poz.45 gear on the shaft may be due to attenuation of the pressure spring poz.38 and tooth wear in the connector poz.40, performs the role of the clutch. Sometimes there is a fault, which manifests itself in the inability to fix the working member of the keyless chuck. Hammers Interskol equipped with two types of cartridges: SDS-plus и SDS-max. Clamp shank of the working tool provided with a special design thereof. Failure of the clamping device is due to wear of the locking ball. 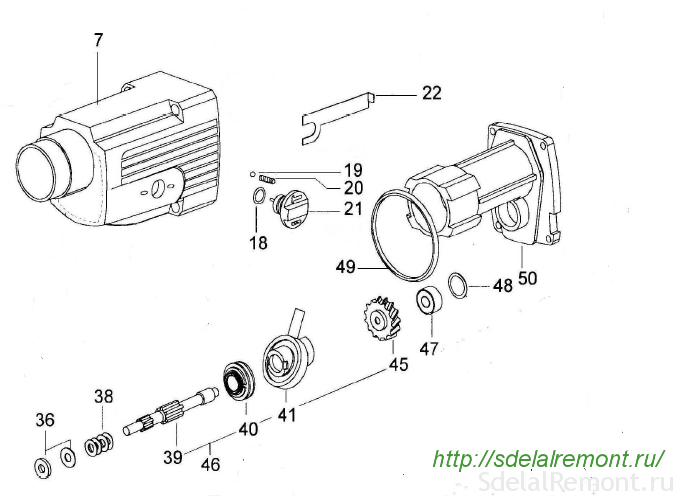 Overhaul pefroratora Interskol, namely it is the keyless chuck replacing the balls and lubricant shanks Boers special grease. As a lubricant for shank drills is recommended a specially designed cream. Hammers Interskol equipped with the mode switch of different designs. And this is no accident. Often a user switches mode Punch, without stopping the tool. A main reason for this failure mode is at the perforators. The switch hammers Interskol modes include a different number of parts. Certain complexity mode switch differs Interskol perforator P-18 / 450ER. Switching modes are carried out by transferring cam poz.44 coupling halves out of engagement with the pinion shaft poz.43. 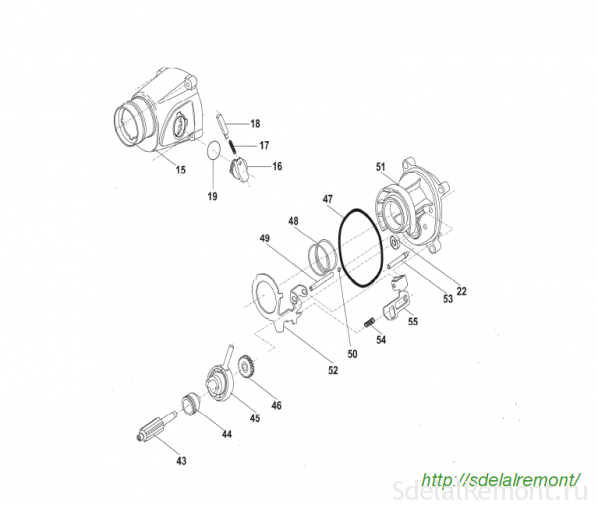 Translation is performed by the mode switch bracket poz.52, Strap switch poz.55, switch knobs pos.16. Faults occur in the impossibility to carry out transfer switch to the desired mode. 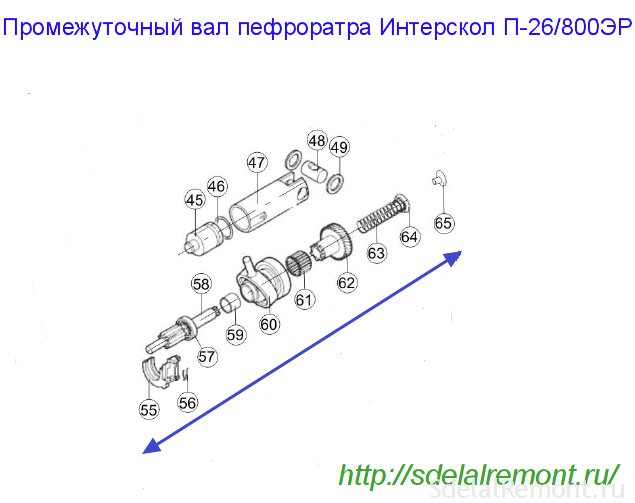 The fault is eliminated by replacing the spring poz.48, alignment or replacement of the bent parts. The complicated structure of the mode switch Interskol perforator P-18 / 450ER has forced designers to design new scheme and introduce it into the punch Interskol P-26 / 800ER. Mode switching is performed by means of a lead switch poz.55, poz.56 spring and switch knobs pos.28. The design uses the smallest number of parts, which increases the reliability and efficiency of the gun Interskol P-28 / 800ER. The punch Interskol P600ER applied a slightly different design of the mode switch. Switching modes is done by removing the clutch poz.40 of rolling bearing poz.41. Electric part perforating Interskol has high reliability and does not cause trouble to the user. the main thing, timely monitor the wear of coal electrobrushes. You must know, that when worn to a length of coal electrobrushes, at 8 mm, brushes must be replaced. Replacing carbon brushes procedure is not complicated and can be performed by any user. Remove the casing of the hand cover, released the brush holder in the designs, which provided and are raised electrobrush. For example, consider a replacement in electrobrushes punch Interskol P-30 / 900ER. Carbon brushes installed in the brush holder poz.72 poz.73. to get the brush, it is necessary to remove the handle overlay poz.78. turn on 45 degrees and remove the brush holder. Relieving spring poz.71, you can easily pull out a carbon brush. stator poz.66, rotor poz.62 fail very seldom. 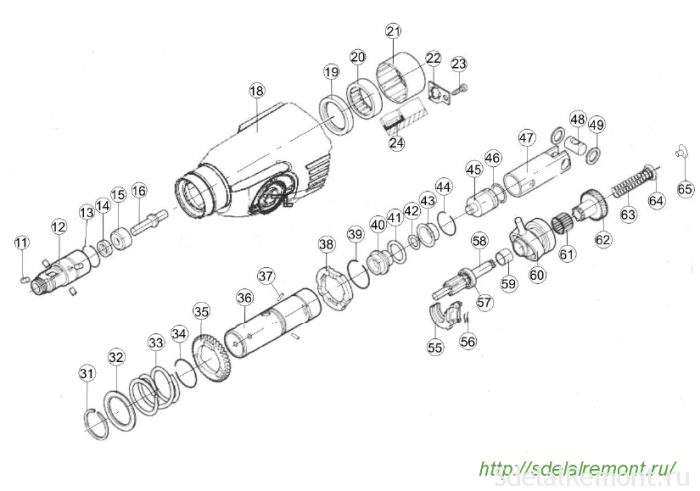 For those, who wish to perform stator Repair or the rotor with your hands answer here. The remaining details, such as off poz.74 tool button, capacitors poz.75, chokes poz.76 fail very rarely and their replacement does not cause too much difficulty. We covered the basic fault hammers Interskol. If you have materials about other faults, write to us.